To make stir-fry sauce, combine all ingredients in a bowl. Set aside. Heat 2 tsp oil in a wok over high heat. 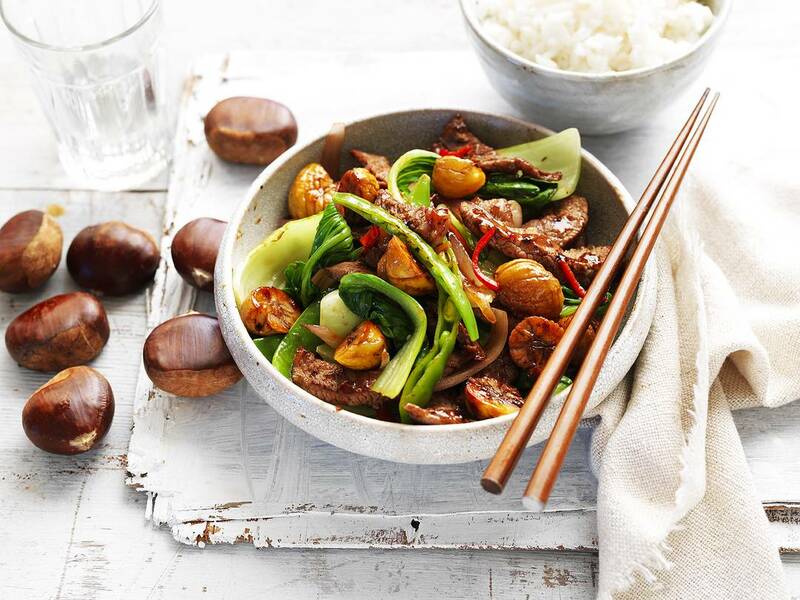 Add chestnuts and stir-fry for 2 minutes until golden. Using a slotted spoon, transfer to a plate and set aside. Heat 1 tbls oil in the wok over high heat. Add half the beef and stir-fry until evenly browned. Transfer to a plate. Repeat using 2 tsp oil and remaining beef. Set aside. Add onion, garlic, ginger, chilli, snow peas and bok choy stems to wok. Stir-fry for 2 minutes. Toss through bok choy leaves and 2 tbls water, cover and cook for 1 minute. Toss through beef and chestnuts.